Western Post-Degree diploma programs are designed to complement your degree, giving you the skills and practical knowledge to launch your career. Our small, interactive classes allow you to connect with your instructors, classmates and community members alike in the London and surrounding area. Develop your personal brand and discover your potential as you prepare to make your mark in the world! We asked some of our post-degree graduates about their experience as a WCS student and working in their field. What piece of advice would you give to a prospective post-degree student? Take advantage of opportunities offered through the program to get involved with the community and gain hands-on experience. Get to know your instructors and volunteer outside of the classroom. Your practical experiences can not only expand your network but will be crucial to growth in your career. What was memorable during your time as a post-degree student? Our class grew together from a group of strangers to close friends to industry partners. Seeing everyone progress professionally has been so rewarding and very memorable. What do you enjoy most about working in Public Relations? Every day is different in public relations and I have the opportunity to work on a variety of projects. I enjoy connecting with new people and attending community events. Have a question you'd like to ask? 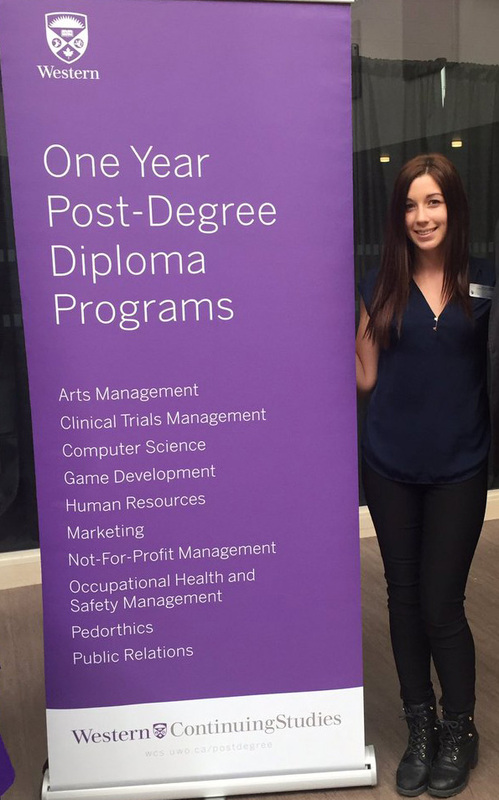 Tweet us your questions using #degree2career or email us at post-degree@uwo.ca!